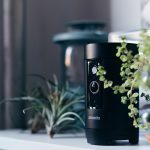 Although we haven’t done any Zmodo reviews on any of the other Zmodo surveillance cameras, their latest introduction in DIY wireless security cameras, the Zmodo Pivot Security Camera is so exceptional, it warrants consideration as an addition to almost any home security security system. It offers 360 degrees of 1080p high definition, full color viewing- in a gorgeous motion activated package. Like most wireless ip cameras, it has an interactive app that enables you to control and observe the camera remotely while notifying you of new activity. But this tiny technological wonder does a whole lot more than just take static high def pics and video. Equipped with integrated motion sensors, the Pivot will automatically sense movement and rotate up to 360 degrees to take a snapshot or video of movement within its field of view. And it functions day or night with infra-red “night vision” that provides round the clock visibility even in low or no light conditions-up to 32 feet. And Pivot is thrifty-saving you time and money. When centrally located, the all-in-one Zmodo Pivot eliminates the need of having to install motion detectors, infra-red sensors and multiple cameras to cover different viewing angles. As if that weren’t enough, the Pivot also serves as a self-contained wireless home security hub that will keep you connected with your home and family and monitor the environment as well. 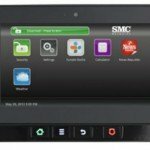 It can interface with wireless door and window sensors- monitoring opening and closings, and send notifications via the free Zmodo SmartLink App. It even has the ability to connect with other smart home automation sensors and has a built in sensor that monitors the temperature and humidity of your home. The Pivot can stand alone, or serve as an outstanding addition to a monitored home security system. Let’s face it….self monitored camera systems have limitations. In the event of an emergency, most folks will sleep better knowing their home is being monitored 24/7 by trained professionals. Ackerman Security, Bay Alarms, Monitronics Security and others.. The pivot even has a built in Bluetooth speaker and 2-way voice capability. This lets you connect to and play your favorite music and and also allows you to listen in and communicate with your family remotely through the included Zmodo SmartLink iOS or Android app. While most security cameras require either a cloud storage subscription, for web hosted storage, or a separate local DVR to store video footage, the Zmodo Pivot gives you the best of both worlds. It comes with 16 GB of internal storage (up to 48 hours of 24/7 footage) . For those who want the additional security of offsite storage, (after all, one could just walk off with the camera….storage and all. Zmodo will also be introducing a cloud based solution. Zmodo may not be household name…yet. I first came across them in 2010 when I was looking for a cost effective conventional camera system, for a small business. I was amazed at the value of the system…but, was even more pleased with the US based customer service. Zmodo has sold over 6 million cameras since their inception in 2009 and offers outstanding sales and support through their offices in Fremont, CA and Champaign, IL. The Zmodo Pivot promises to raise the bar in the wireless ip home security camera and automation market segment. While pricing has yet to be finalized, it appears that the Pivot will be offered between $199.95-249.95. This is an outstanding value for an autonomous wireless security camera with this feature set. It appears to be similar to the Angee, without some of the frivolous (and perhaps “fussy”) bells and whistles-at roughly half the price. The Pivot is a 360° robotic camera, with security and home automation capabilities, that will likely come in at or below traditional fixed wireless ip camera offerings from the likes of Canary, iSmartAlarm and Piper Home Security. Get Zmodo Pivot at Amazon-Just $99.00! Thank you for visiting. For a detailed, in depth review, please visit our Zmodo Pivot Hands On Review. Please feel free to leave comments of feedback on Zmodo Pivot Security Camera, below. If you would like to get our Home Security Guide, our latest updates, make sure you join our community by signing up for our newsletter. I believe that the question about The Pivot App controlling multiple devices was answered earlier in the comment string. Yes. Android device so down loading from Google is useless. Tech support indicated that I have to down load to a smart phone and set up the wifi before I can use the PC. Since the app is not available in the Apple store and I don’t have an Android device, the device is completely useless. Returned it to QVC. I bought the Zmodo– the app can support several devices (Zmodos). There is a “+” sign in the upper right hand corner on my screen– tap it and it brings you to fields where you can add devices (Zmodos). If you are in two different homes, I expect each device has to be synched to the corresponding router– but one App on each tablet/phone should suffice. Hope that helps– I’ve been really happy with mine! Also having a difficult time with customer support! …Been on hold close to an hour already and the “live chat” seams to be more dead than anything else! Simple question is all I have: We have two Zmodo Pivots for two separate homes. Can we use one app for both or does it require a separate download again for the second home? I can’t seem to get customer service or support to provide firmware update to close the security hole in their cameras. I bought 4 and can’t get the update since they don’t and won’t provide a download link. Avoid unless you want predators monitoring your zmodo cameras! Sorry to hear that you are having difficulty. I have always had good luck with Zmodo support. Not sure what firmware issues there are or what updates are available, but support is available via phone, email and chat, here.